Randin is a poor, nonindustrial desert hellworld with a population struggling to survive in an inhospitable environment. 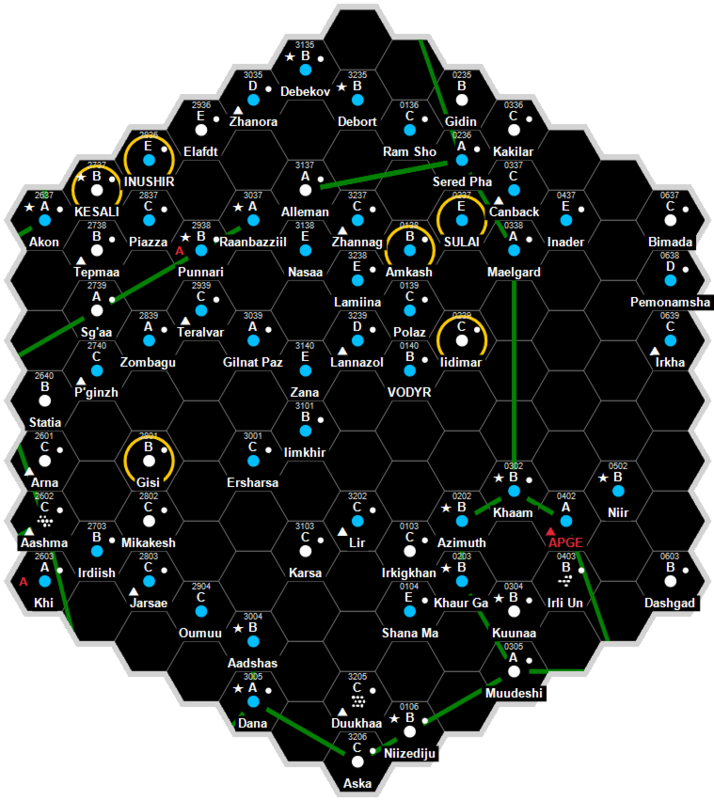 It is a Non-Aligned world dominated by human sophonts located in the Loran Subsector of Halcyon Sector. The primary is Larssen, an ordinary orange main sequence star with a luminosity of 0.284 Sols, a mass of 0.723 Sols, and a diameter of 1.073 million km. The inner zone consists of (I) a vacuum inner world and (II) a corrosive atmosphere inferno world. (III) Randin orbits within the habitable zone and is designated the mainworld. (IV) a sparse rocky planetoid belt, (V) a ringed large gas giant, (VI) an exotic atmosphere bigworld, (VII) a vacuum iceworld, (VIII) a small gas giant, and (IX) a trace atmosphere iceworld form the outer system. Many of the worlds retain satellites. (III) Randin is designated the mainworld. It orbits Larssen at a mean distance of 0.68 AU (101.7 million km), within the habitable zone. It has an orbital period of 240 days 21 hours and a rotation period of 18.5 hours. The axial tilt is 28 degrees. Randin has a diameter of 6,344 km, a density of 5.98 g/cm³, and a surface gravity of 0.54 G. The world is geologically very active. Its atmosphere is rated as Thin, Tainted, with a mean surface pressure of 0.53 bar and a composition of 83% nitrogen (N2), 15% oxygen (O2), 1% carbon dioxide (CO2), and 1% argon (Ar), water vapor (H2O), neon (Ne) and other trace gases. The taint is caused by the very low level of oxygen, high levels of carbon monoxide (CO), sulfur dioxide (SO2) and hydrogen sulfide (H2S) of geological origin, as well as fine wind-borne dust. Approximately 4% of the surface is covered in lakes of liquid water: average tidal ranges are negligible. Mean surface temperature: 36°C. The atmosphere is active and weather systems driven by the star scour the surface. The climate is seasonal. Total surface area: 126 million km², Land surface area: 121 million km², Water surface area: 5 million km². Randin, the mainworld, has extensive but primitive native life, consisting entirely of microscopic organisms that exist in any location where they can find even a minimal trace of water. Their metabolic processes maintain a cycle of atmospheric renewal and are gradually changing the atmospheric composition. Randin has a good quality starport. Randin possesses a Technology Level of TL–10 or TL-A in Hexadecimal Notation. Randin has a Representative Democracy government. This page was last modified on 1 July 2018, at 06:23.